Leo I (Latin: Flavius Valerius Leo Augustus; 401 – 18 January 474) was Eastern Roman Emperor from 457 to 474. A native of Dacia Aureliana near historic Thrace, he was known as Leo the Thracian (Greek: Λέων Α' ὁ Θρᾷξ Leōn ha ho Thrax). Ruling the Eastern Empire for nearly 20 years, Leo proved to be a capable ruler. He oversaw many ambitious political and military plans, aimed mostly for the aid of the faltering Western Roman Empire and recovering its former territories. He is notable for being the first Eastern Emperor to legislate in Greek rather than Latin. He is commemorated as a Saint in the Orthodox Church, with his feast day on January 20. He was born Leo Marcellus in Thracia or in Dacia Aureliana province in the year 401 to a Thraco-Roman family. His Dacian origin is mentioned by Candidus Isaurus, while John Malalas believes that he was of Bessian stock. He served in the Roman army, rising to the rank of comes. Leo was the last of a series of emperors placed on the throne by Aspar, the Alan serving as commander-in-chief of the army, who thought Leo would be an easy puppet ruler. Instead, Leo became more and more independent from Aspar, causing tension that would culminate in the assassination of the latter. Leo's coronation as emperor on 7 February 457, was the first known to involve the Patriarch of Constantinople. Leo I made an alliance with the Isaurians and was thus able to eliminate Aspar. The price of the alliance was the marriage of Leo's daughter to Tarasicodissa, leader of the Isaurians who, as Zeno, became emperor in 474. In 469, Aspar attempted to assassinate Zeno and very nearly succeeded. Finally, in 471, Aspar's son Ardabur was implicated in a plot against Leo and Ardabur was killed by palace eunuchs acting on Leo's orders. Leo became very unpopular in his last days as Emperor for abolishing any non-religious celebration or event on Sundays. Leo died of dysentery at the age of 73 on 18 January 474. Leo and Verina had three children. Their eldest daughter Ariadne was born prior to the death of Marcian (reigned 450 – 457). Ariadne had a younger sister, Leontia. Leontia was first betrothed to Patricius, a son of Aspar, but their engagement was probably annulled when Aspar and another of his sons, Ardabur, were assassinated in 471. 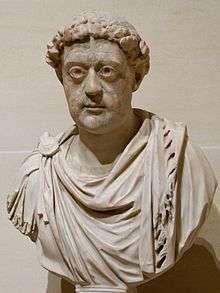 Leontia then married Marcian, a son of Emperor Anthemius and Marcia Euphemia. The couple led a failed revolt against Zeno in 478–479. They were exiled to Isauria following their defeat. An unknown son was born in 463. He died five months following his birth. The only sources about him are a horoscope by Rhetorius and a hagiography of Daniel the Stylite. The Georgian Chronicle, a 13th-century compilation drawing from earlier sources, reports a marriage of Vakhtang I of Iberia to Princess Helena of Byzantium, identifying her as a daughter of the predecessor of Zeno. This predecessor was probably Leo I, the tale attributing a third daughter to Leo. Cyril Toumanoff identified two children of this marriage: Mithridates of Iberia; and Leo of Iberia. This younger Leo was father of Guaram I of Iberia. The accuracy of the descent is unknown. ↑ Great Synaxaristes (Greek): Ὁ Ἅγιος Λέων Μακέλλης ὁ Μέγας. 20 Ιανουαρίου. ΜΕΓΑΣ ΣΥΝΑΞΑΡΙΣΤΗΣ. ↑ Mother of God of the "Life-Giving Spring". Self-Ruled Antiochian Orthodox Christian Archdiocese of North America. Retrieved: 27 October 2012. ↑ Friell 1998, pp. 170, 261. ↑ Friell 1998, pp. 170. 1 2 Bury 1958, p. 315. ↑ Edward A. Thompson, "Leo I", Encyclopaedia Britannica, Vol. 13 (Encyclopaedia Britannica, Inc., 1973), p. 959. Bibl. J. B. Bury, History of the Later Roman Empire, vol. i, ch. 10 (1923). ↑ Edward Gibbon, The Decline and Fall of the Roman Empire, Volume I, Chap. XXXVI (Chicago: Encyclopaedia Britannica, Inc., 1952), p. 582. Bibl. Theophanes, p. 95 [ed. Par. ; tom. i p. 170, ed. Bonn]. ↑ Hugh Elton, "Leo I (457–474 A.D.)"
Friell, Gerard (1998). The Rome That Did Not Fall: The Survival of the East in the Fifth Century. Ancient history. London: Taylor & Francis. ISBN 978-0-415-15403-1. Thomas F. Madden (Presenter) (2006). Empire of Gold: A History of the Byzantine Empire; Lecture 2: Justinian and the Reconquest of the West, 457–565 (Audio book). Prince Frederick: Recorded Books. ISBN 978-1-4281-3267-2.